The Kingdom of Hay, in Wales, is more than just a little unique. The entire “kingdom” is comprised of just 1,500 people but it boasts a whopping thirty second hand book stores… that’s one bookstore for every fifty people! 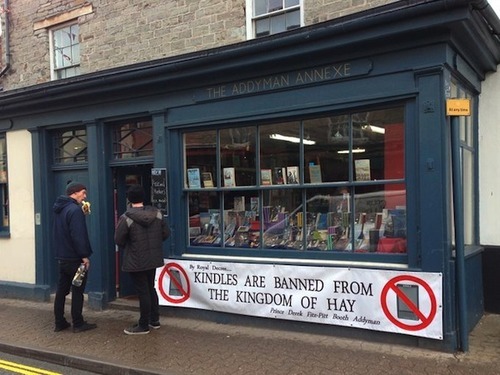 Since 1960, the town has accepted used and discarded books and proudly calls itself “The Town of Books.” Kindles and their ilk, as you can see above, are not welcome. If you are getting ready to pack your bags for this year’s ten day festival, better hold on. Unfortunately, the festival has just concluded. 2014’s Hay Festival runs from May 22 – June 1, 2014.